Oh, golly. The sky is the limit on could. Ask a more direct question. Well. Yeah. You see…we…um…not much. I see the potential. I know the market is there. I just have a hard time introducing myself to that market. We’re learning every day but we’re still in school. You can do the math. We raised 900 birds on a little over an acre to an average of 5 pounds dressed. 4500 pounds of chicken sold at a minimum of $3/pound. Chicken feed isn’t free. Chicks aren’t free. Electric netting isn’t free. Land isn’t free. My time is worth something. So, we come out a little ahead on our season but we’re not getting rich. We do better with pigs. Pigs need our attention for about 2 minutes/day, every day for 4 or 5 months. Then we load them into a trailer (which can be hilarious frustrating interesting) and send them to town. 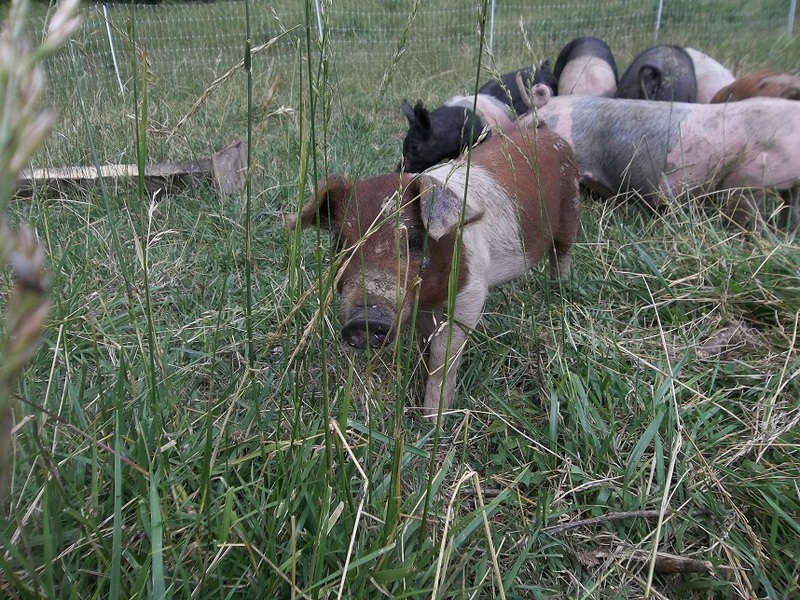 We have annual pig revenues in the hundreds of dollars. Yup. We’re small. Many of the things we do are just first efforts. We are still learning what works here. 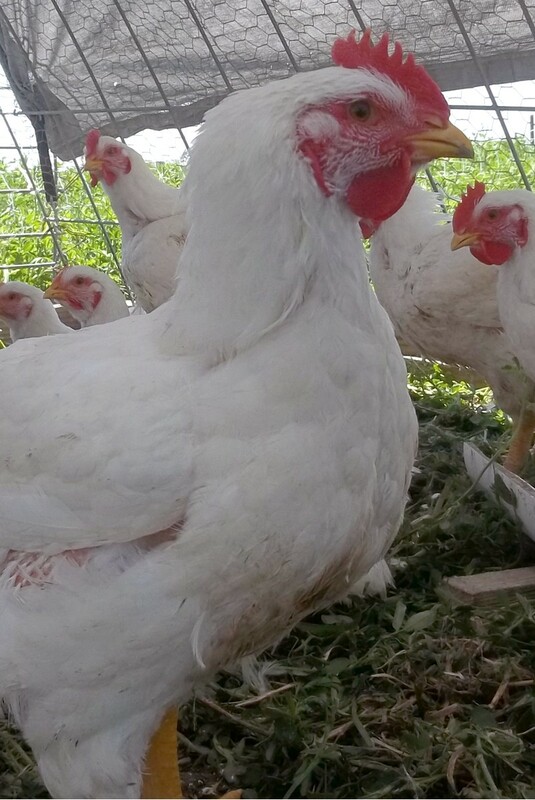 Yes, I have read Salatin’s Pastured Poultry Profit$: Net $25,000 in 6 months on 20 acres. My copy is pretty worn. Yes I have 20 acres. Yes I raise poultry. Yes, I have studied the 40 pages in that book on marketing. I agree with Salatin that sales are driven less by advertising and more by word of mouth. We have a superior product. Our customer feedback is positive. It just takes time to build sales…to get your name out there. This is our third year raising chicken and we are taking it slowly. We have to. It would be very easy to outstrip our sales with production. While we have always sold out on chicken and pork there is more than just numbers involved. We have to find ways to get the work done. Just doing the work is tiring. We could raise more chicken but when? I have no doubt we could raise more pigs but I don’t know how many more. We need time to figure it out. Could I make my farm payment from the farm? No doubt. Could I make a living by farming alone? I don’t know. I suspect I could but I need more time. Time to learn. Time to market. Time to figure out what works. Time to try new things. Time to grow. I have to learn about pasture management. I have to learn about seasonal changes, annual changes, multi-year drought management, low-stress livestock handling, water management, nutrient cycling, winter stockpile management, managing differences between North-facing slopes and South-facing slopes….you see where this is going? Orcharding, aquaculture, growing and marketing vegetables…on and on. It takes time to learn/try/recover from each. Time is not on my side but I have to resist the temptation to force something to happen. It has to grow. We have to move slowly. Farming is a biological process. Biological processes take time. I could present you a business model that shows $X over X years but it would not be honest. There is a lot of work to do. There is a lot to learn. Things take time. You better get started now. This entry was posted in Lessons Learned and tagged Farming, Getting Started, Marketing, Moving Slowly. Bookmark the permalink. ← How does the Week Look? I have also read salatins book twice. I have taken many notes and I have 50 broilers coming in August to raise just for my own consumption as a test run. I live in Springfield Tn just outside of Nashville Tn. Currently we sell almost all the eggs we produce to a local co-op of families that buy all natural foods. This small group is made of 8 families. They live in my area but work in Nashville at professional jobs. I think trying to market in the Springfield area would be a waste of time. We are too rural and there would be too many farmers willing to sell for less saying their product is just as good. My plan is to go to the Nashville farmers market and sell eggs, honey, and whatever else I happen to have but to use that time to market the broilers. Of course I wont acutaully have any birds with me to sell so I will have to rely heavily on posters and pictures. My youngest daughter loves playing with the chickens and she will be part of the maketing plan. People are buying the concept as much as the product. I hope to get a good start on a mailing list of people interested in buying the broilers. I will also market our facebook page in all the literature so that if they walk away without getting on the mailing list they can still contact us through our page (ellenseggsnmore). This page is full of pictures of everyday farm life on our farm. That was a great comment Kelly. Lots of good ideas for ways to find a market. Keep us informed as you grow. 50 broilers aren’t enough. Does your state allow you to sell at farmer’s markets? Or do y’all already do that? Keep the faith…it’s all in His time. I tell myself that everyday as I sit on an acre wooded lot in the suburbs. My soul needs to have land and we are working on that goal everyday. Even in my suburb, the kids and I went and picked blackberries and made blackberry cobbler after dinner. We talked about how we could do the same on the farm. My kids have totally bought into the farming life and that’s a plus. All in due time….all in due time. I can either take my chickens to a state-inspected processing plant 3 hours away and sell them at farmers markets OR I can process them on farm and sell them on farm. The two license types appear to be incompatible. Ive been working hard on the marketing thing. It’s tough. Seems like there is no silver bullet for it. We are doing the Facebook thing, word of mouth and are thinking about doing Eatwild and/or Local Harvest. We sold almost all of our first batch of chickens to people at work. I’m going to have to look into Eatwild. Selling that first 500 chickens isn’t that hard. Raising and butchering them is hard. When you set your sights on 1,500 birds the logistics of handling them, feeding them, watering them becomes much more difficult. There’s a level of skill involved at each step along the way. It takes time to develop those skills. Funny you should post about this – we just had a big discussion about profit and marketing. We still have a big learning curve ahead of us and a definite requirement that any and all enterprises pay for themselves, and less time ahead of us than you :). The challenge for us in the past has been to have consistent quantities available. I’m not talking seasonality here – that’s something that customers can be educated to, and that with planning we could accomodate by having different product available in different seasons. Our problem has been reliablity – due to family circumstances – 2 years out of the last five we either didn’t grow any broilers, or we grew enough only for 2 customers. Not the way to grow the business. We’ve actually talked about hiring someone to come move them for us in the morning or to feed in the afternoon on days that we work if we started to try and raise more than 300 at a time. Not sure how the figures would work out for that though. Hiring someone would definitely cut into the profit margin, but it would also be a relief to know the birds were not stressed by lack of food or water because you were delayed getting home from work. I have resident teenagers, who top up food and water after school, so I’m lucky. Now that I have a good dolly they could probably move the pen too. Maybe you have a teen in your neighbourhood somewhere? If you’re moving up in scale on the enterprise, it might be worth it.